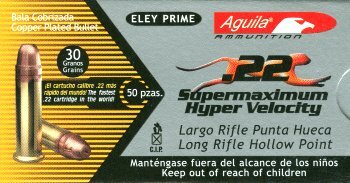 Our Aguila Super Maximum 22 LR Hollow Points are truly extreme velocity ammunition for the 22 LR. With a muzzle velocity of 1750 fps, these 30 gr. hollow point bullets shoot flat and are deadly on small game. The complete list of all 22 LR ammunition that we have available is at our EABCO 22 Ammo Page.